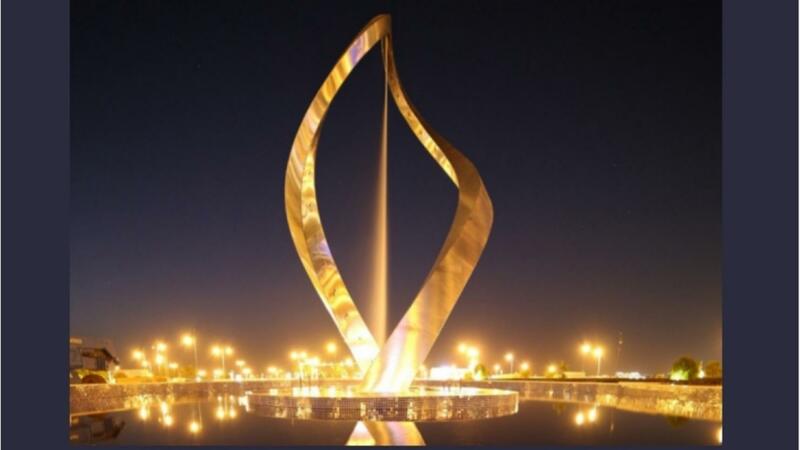 A water sculpture created by British artist Giles Rayner is winning fans and helping to light up Oman’s capital after going on display near the Royal Opera House Muscat. Commissioned in late 2015 by Muscat Municipality, it took thousands of man hours and an international team to bring the Arches of Oman sculpture from concept to reality. A primarily British team, operating under the leadership of commission director Julian Glyn-Owen, was bolstered by specialists and materials from Oman, Finland, Germany and Italy. A group of 12 companies, made up of design engineers, fabricators and other specialists, were involved in the initial stages of development. Made from high-grade stainless steel, the sculpture was pre-polished in Birmingham and cut, formed and fabricated in Darwen. A final trial assembly took place in Rotherham before the sculpture was shipped to Oman. Water and electrical systems hidden beneath the site were designed and tested in the UK before being installed late last year ahead of the piece’s arrival in the sultanate. Mr Rayner, whose work can also be found in locations across North America and Europe, said the design of the sculpture was influenced by the architecture of the Royal Opera House. He said: “Movement is provided by the variable water jets and also by its sinuous curves which cause it to appear to rotate as you pass around it. It is the focal point of the beautifully landscaped gardens in which it sits. The Arches of Oman sits above a 25m-wide oval pool and reaches 12m in height. Its design is formed of two entwined tusks that curve around one another, with a flowing curtain of water arcing and falling between them.